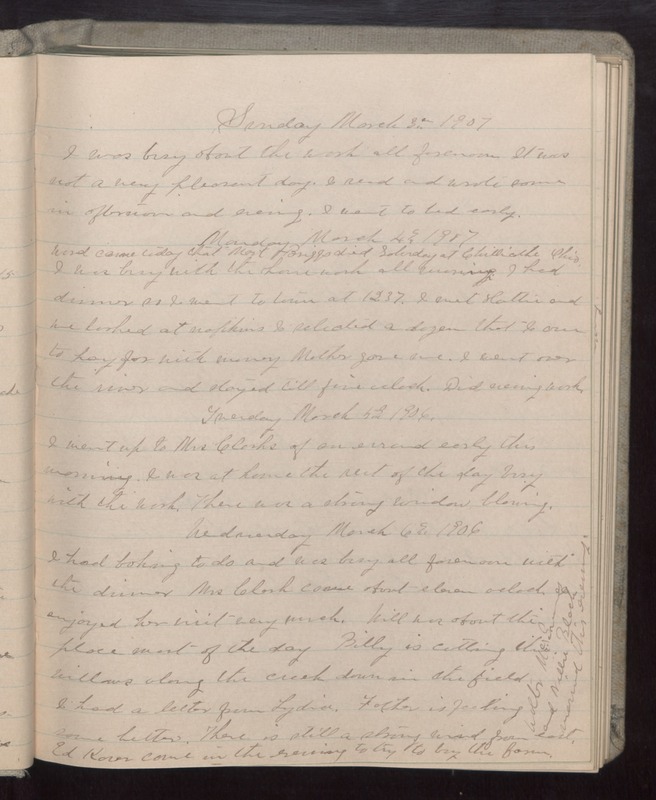 Sunday March 3 1907 I was busy about the work all forenoon It was not a very pleasant day. I read and wrote some in afternoon and evening. I went to bed early. Monday March 4 1907 Word came today that [Mort?] Briggs died Saturday at Chillicothe Ohio. I was busy with the house-work all morning. I had dinner so I went to town at 12.37. I met Hattie and we looked at napkins I selected a dozen that I am to pay for with money Mother gave me. I went over the river and stayed till five oclock. Did evening work. Tuesday March 5 1906 I went up to Mrs Clarks of an errand early this morning. I was at home the rest of the day busy with the work. There was a strong window blowing. Wednesday March 6 1906 I had baking to do and was busy all forenoon with the dinner Mrs. Clark came about eleven oclock. I enjoyed her visit very much. Will was about the place most of the day. Billy is cutting the willows along the creek down in the field. I had a letter from Lydia. Father is feeling some better. There is still a strong wind from east. Ed [Kozer?] came in the evening to try to buy the farm. Walter [illegible] and Nellie Black married this evening.